I had to rename these rolls as i made them for all the empresses who attended the asian ladies high tea. It was out of the theme as The Host Empress, Sumi had prepared a complete menu for an English high tea with jams and clotted cream to go with the scones, several platters of sandwiches and 5 pots of different types of tea to choose from. The table was set with Royal Dolton fitted for the Queen of England. Thank you Your Highness, Sumi for being such a gracious host. 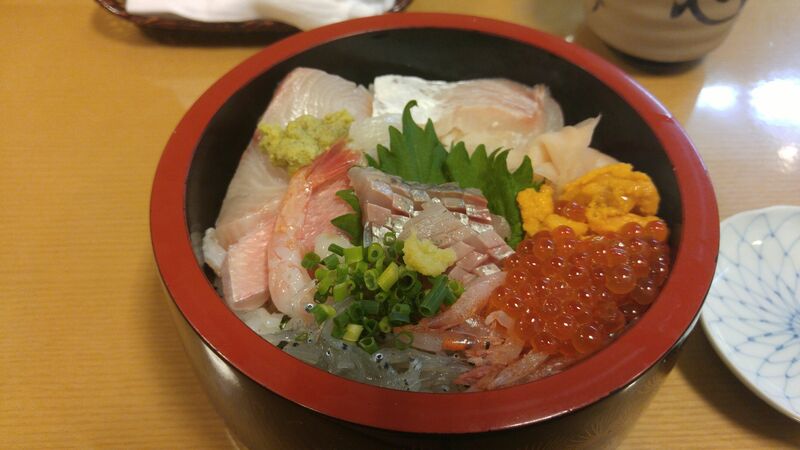 Mix all the above except the red bean paste and knead to a smooth dough. Leave to rest. Divide dough and red bean paste into 4 portions. Using plastic wrap, roll one portion of the red bean paste out to 1/8 inch thick rectangle and roll dough to the same size and thickness as the red bean paste. 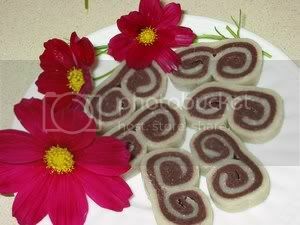 Top the red bean paste rectangle with the dough rectangle and roll up both ends to meet. 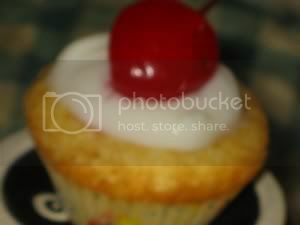 This recipe is from JoDeliBakery and the cupcakes were so good that Renee, who normally does not eat well, ate 6 at one go. Thanks Jo for sharing. The cupcakes freeze well and i could make them way ahead. I will thaw them the night before the party and decorate them with icing on the party day. Sift cake flour, baking soda and baking powder into a mixing bowl. Set aside. Cream butter and cream cheese until light and creamy for 8-10 minutes. Add castor sugar and continue to mix until light and fluffy. Beat in eggs, one at a time. Stir in lemon rind and lemon juice. Finally, fold in sifted flour. 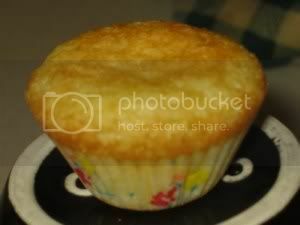 Fill a big piping bag with plain nozzle, pipe batter into paper cups. Rest for 10 minutes before removing the cupcakes from the pan . Decorate as you wish and serve chilled. 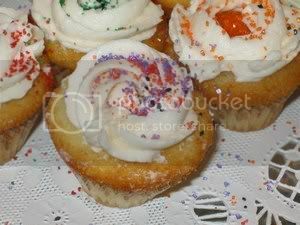 These minis can be frozened and thawed before decorating. 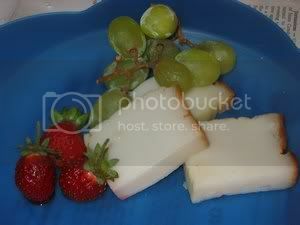 This kuih is called 'Fei Chee Yau Koh' in cantonese and translated is 'lard' as the appearance resembles it. 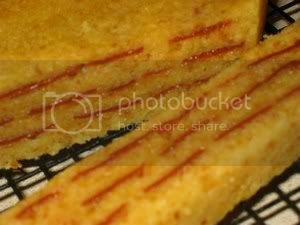 This kuih should be bouncy and flexible when a piece is held, therefore to achieve this, this kuih should be baked in 8 inch cake tin with a height of 2 1/2 inch. Slice thinly for serving. In a pot, combine sugar, water and pandan leaves . Bring to a boil to dissolve the sugar and cool the syrup then discard the pandan leaves. Put sifted flour into a large mixing bowl. Stir in coconut milk into soaked green bean flour mixture and sifted rice flour. Add the cooled syrup and salt and mix into a batter. Strain batter into a large microwable bowl and cook on high 1 minute at a time until it thickens and bubbles. Stir with a whisk after every minute. Pour cooked custard into a 8 inch square tin lined with softened banana leaf. Spread and smooth the surface with a spatula. Bake in preheated oven at 400 f for 30 minutes until the topping is lightly brown. Glaze with coconut cream and broil/grill until top is brown. These curry puffs are party favorite for the guests as well as for me because i can make them ahead of time and freeze them. The pastry in this recipe is crispy even when puffs are cold. 1. Boil margarine, water and salt. Pour into the flour. Add in egg. Knead well. Let dough rest for a while. Divide into 8 portions. 2. Mix flour and lard/shortening together. Knead well and divide into 8 portions. 3. Wrap inner layer with outer layer. Flatten it and then roll it up like a swiss roll. Repeat twice and then divide into 2 portions. 4. With cut side on the table, roll dough into a circle and fill with a spoonful of curry filling. Wet the outer rim of circle and fold into half, seal the edges. 5. Puffs can be left to freeze and packed in ziploc bag when frozen until needed. 6. To fry frozen curry puffs, start them in cold oil. 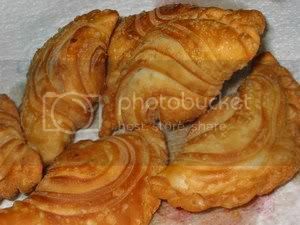 Remove several ladles of hot oil as the puffs are slightly brown, turn heat on to the highest and fry puffs until brown. This way will ensure that the puffs will not be soggy. 7. To fry the second batch, add in the slightly cool oil and put in the frozen puffs, frying the same way as no.6. 8. Put fried puffs in 250f oven to keep warm. Boil the potaoes till soft. Heat oil ,sweat the shallots and add in ground chilly(paste). Fry until fragrant then add curry powder. Add in the cubed chicken, then onions. When chicken is no more pink add in coconut milk. Simmer until filling thickens, season with salt and sugar. Overriped bananas and fruits piled up fast in the fridge. Like the chinese saying goes 'ngan foud tho chak' - the eye is bigger than the stomach, I will buy in abundance and can't catch up with the eating. So....., being as frugal as i am, will have to turn them into something delicious. 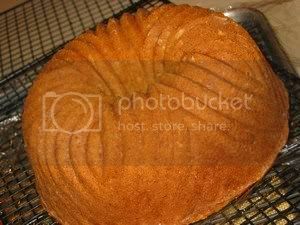 Grease the bundt pan with shortening and dust with flour. Preheat oven to 325 degrees F convection. In another large bowl, whisk together the sugar, oil, egg, egg yolk, mashed banana and peaches and yogurt/sour cream . Add the dry ingredients that is the sieved flour. .
Stir mixture for a count of 10. Add coconut and walnuts to mixture and stir 3 more times. Pour batter into prepared bundt pan and place into the oven . Bake for 50 to 55 minutes, test for doneness. Remove from oven and cool for 15 minutes. Turn cake onto rack and then wrap a very hot towel over the cake pan. Leave it on for 5 minutes and cake will dislodged. Serve immediately or store in airtight container for 2 to 3 days or wrapped tightly with cling wrap and aluminium foil and leave in freezer. Thaw in fridge or countertop before serving. Renee likes to eat haw flakes and calls them 'apple' but one day she says she don't like them anymore and i am landed with a pantry full of them. Found this recipe at http://jodelibakery.netfirms.com/ and since i have all the ingredients, i gave this recipe a try and viola, it is so delicious. Thank you jo for sharing. Prepare a 8-inch cake tin. Lightly grease with butter/margarine. Crush cream crackers until they resemble breadcrumbs. in the food processor or alternatively, use a large ziploc bag, close and crush with rolling pin. Beat butter and condensed milk until creamy. Add egg yolks one at a time and beat until well incorporated. Add crushed crackers into mixture of Step 3. Mix well. Fold egg whites into batter. Bring water in a steamer to boil. Place prepared cake tin into steamer and using a 4 oz ladle, scope batter into tin. Level batter with a small offset spatula. Top batter with Haw Flakes and steam for 5 minutes. Repeat layering of batter and haw flakes, and steaming until all batter is used up. Increase steaming time as the cake becomes thicker. When all batter is finished, steam cake for further 30 minutes. Let cake cool completely before turning it out from the cake tin. If you are using normal plain crackers (not cream crackers), weight of butter/margarine can be brought up to 400g.